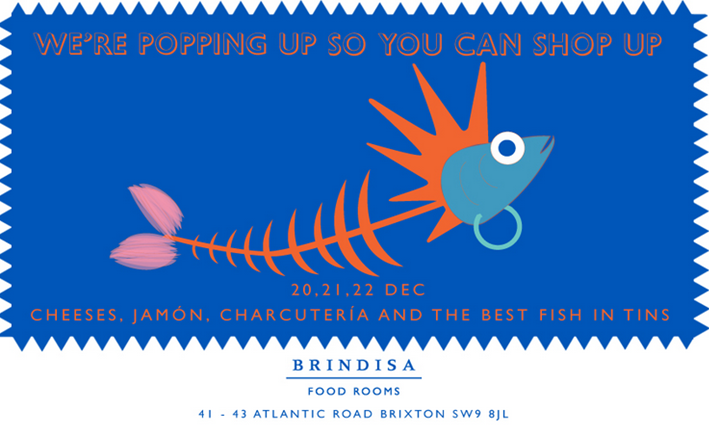 Brindisa are popping up in Atlantic Road, Brixton, for 3 days from Friday 20th December, selling food, and also hot chocolate for shoppers, prior to a full opening there in 2014. A chance to stock up on lots of yummy treats for Christmas! "We will be popping up shop in Brixton this weekend, from Friday to Sunday. We’re setting up shop for 3 days in our half-completed railway arch at 41-43 Atlantic Road which is soon to be Brindisa Food Rooms. We’ll have Jamon Iberico de Bellota, Chorizo, aged Manchegos, the best tinned fish, smoked paprika, olive oil crisps, cooking chorizo, Gordal olives, quince paste, turrón and much much more! We hope to see you later this week! We´ll give some hot chocolate to shoppers, will give out Rabitos and we will be carving ham"
Sunday 22nd, 10 - 5pm.